Project 500, Channel Strip from Aphex. Aphex announces the availability of two new processors in API 500 formats, the Project 500 channel strip and CX 500 gate and compressor. 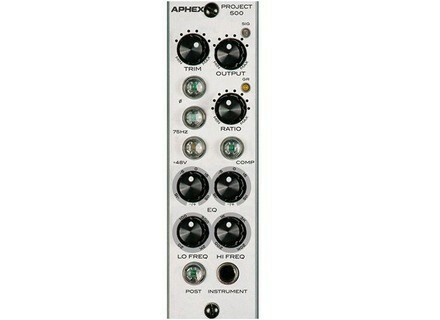 The Aphex Project 500 is a channel strip module featuring a Class A preamp, an optical compressor, an overlapping two-band EQ, and a Jensen JT-11DL transformer to balance the output. 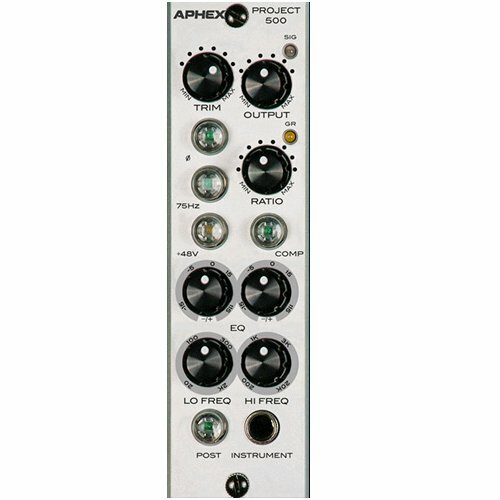 The preamp and compressor are taken from the Aphex Project Channel, the EQ section is inspired by the EQF 500 module. The CX 500 combines the Aphex Logic-Assisted Gate and EasyRider auto compressor. Gate and compressor are designed to work together in an integrated system: enabling the gate prevents the compressor from raison the signal level while the gate is trying to lower it. The gain reduction is then frozen until the gate opens again, which prevents from level jumps. Controls available on the CX 500 include threshold, attack, hold, release, speed, depth and output level. A LED bargraph meters either the output level or gain reduction. MSRP is 600€. TB Audio Model 23N 500 mic preamp The new TB Audio module is a microphone preamplifier ready to be installed in a 500 lunchbox. Candid comments from the renowned producer/engineer about gear, mixing and more One of the best known and most successful producer/engineers in the business, Grammy-winner Jack Joseph Puig has worked with heavyweights like U2, Green Day, Stone Temple Pilots, John Mayer, Fergie, Eric Clapton, Queen Latifah and countless others. Puig wears many hats, including as an executive vice president at Geffen Records, and as Director of Creative Innovation for Waves, where he helped develop the Jack Joseph Puig signature plug-in collection. Fluid Audio introduces the C5W monitors Fluid Audio has improved its C5 nearfield monitors for home studio in the new C5W black and white version.